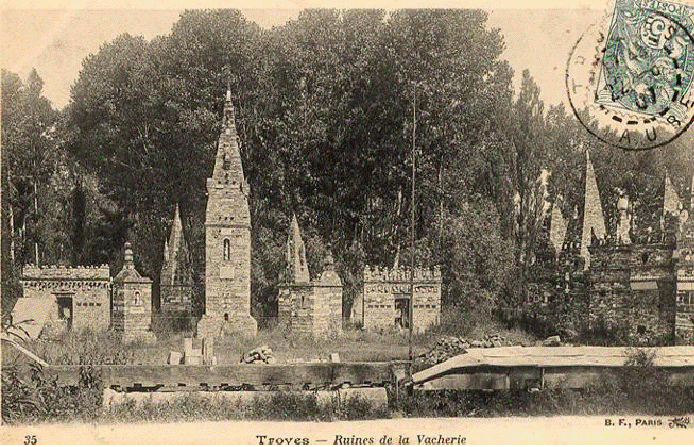 The ruines publiques in this post were located in the french city of Troyes, north east of Paris. 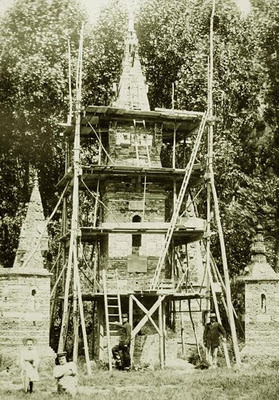 It was a large scale construction made of materials from buildings that were demolished in the 19th century. The site, on its turn, has been demolished too. The course of history. The story of this environment has been told by the city of Troyes' librarian, Louis Morin (1866-1942), who in 1901 wrote an article in the local publication Almanach du Petit Troyen (republished in Gazogène nr 19). The firm of the Bourgoin family, run by a father and his five sons, during the 19th century exploited a gravel pit outside the city, in an area named the Vacherie. Business went well, especially as in the 19th century more national roads were built. In the last decades of the century it also would happen that inner cities were restructured and old buildings were demolished. The Bourgoin firm diversified its activities and also focused upon transport and the removal of debris. 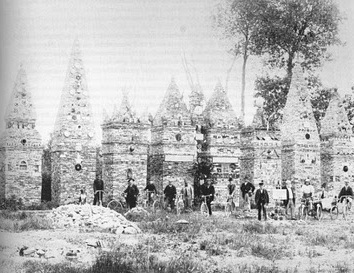 Auguste Bourgoin used the debris to make kind of a monument that evocates the fate of these constructions. He began in 1896 and when Morin in 1901 wrote his article, he had finished some eight towery structures and was active constructing the ninth. Ultimately Bourdin would construct some sixteen towers. The structures, some of which a ten meters high, were assembled without mortar. They have been arranged rather precisely, probably according to a plan Bourgoin had developed before he started constructing. In between some of the towers a clock was depicted, it's hands on a quarter to twelve, perhaps indicating the end of the century. This is an environment with a message. "There is in this, it seems, a philosophical intention. It is a synthesis of debris of all kinds, that brings together witnesses of countless demolitions, the glazed brick of a bourgeois pavilion joins the rubble of a cottage, it is a mess of domestic and industrial waste. These monuments are actually heaps of ruins, they are even more ruined now that they are remote from their original location and even in thought one can not reconstruct their original form"
As said, the constructions have disappeared, to make way to urban development (probably after WW II). Up to now I could not trace when this happened, neither could I find biographical data about Auguste Bourgoin. Just one small remnant is still there. On the premises of a shop in the Vacherie area, there is a little pyramid, which can be seen from the street.